Click the Logo Below to Purchase Certified Organic Spirulina online now via our secure site. As a health supplement, Spirulina algae is an extremely high protein source with a protein content of 60-70 percent higher than any other natural food and most nutritional products. However, even greater nutritional value can be found in its high concentration of vitamins, minerals and other beneficial nutrients. This super food has the most remarkable concentration of functional nutrients ever known in food - animal or plant. When it was found that Spirulina grew so fast (producing 20 times more protein per acre than soybeans) they named it the food of the future. On top of this, spirulina delivers more nutrition per acre than any other food on the planet. This has extraordinary implications for more efficient and sustainable food production in the future as we advance into uncertain economic times. 3-10 grams a day of the organic green as a nutritional supplement delivers impressive amounts of vitamin B12 & B complex, iron, essential trace minerals, beta carotene and gamma-linolenic acid. 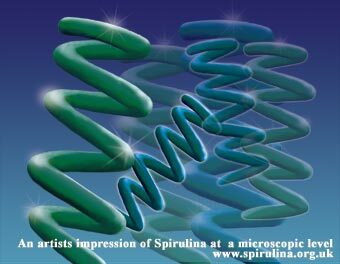 Beyond vitamins and minerals, spirulina is a super antioxidant. It is rich in phytonutrients and functional nutrients that have a profound positive effect on health. For starving people in third world countries, this super concentrated food would bring a quick recovery from malnutrition. In developed countries, the diet is loaded with unhealthy and nutrient depleted foods, which are being consumed in excess. This creates a calorie overload yet still does not achieve our nutritional requirements. We now know that organic spirulina can renourish our bodies and renew our health. It is legally approved as a food or food supplement in the USA, Europe, Japan, UK, Australia, India, China, New Zealand and many other countries around the globe. The United States Food and Drug Administration confirmed in 1981 that this green food is a valuable source of protein and contains various vitamins and minerals and therefore can be legally marketed as a food supplement.